This example shows how to design a MIMO LQG regulator to control the horizontal and vertical thickness of a steel beam in a hot steel rolling mill. Figures 1 and 2 depict the process of shaping a beam of hot steel by compressing it with rolling cylinders. 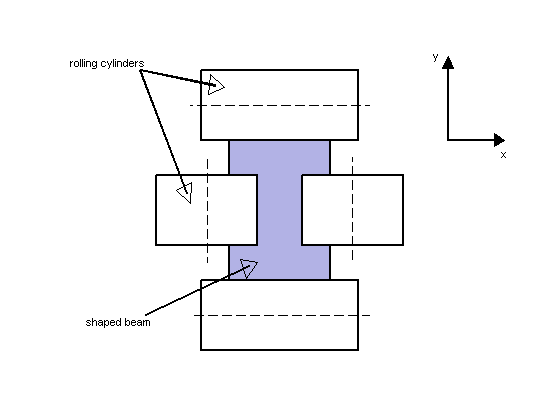 Figure 1: Beam Shaping by Rolling Cylinders. 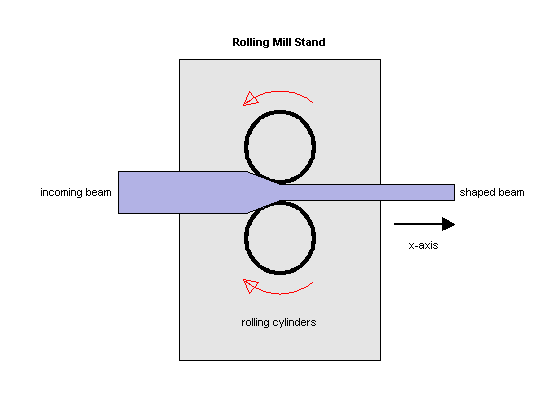 Figure 2: Rolling Mill Stand. The desired H shape is impressed by two pairs of rolling cylinders (one per axis) positioned by hydraulic actuators. The gap between the two cylinders is called the roll gap. The goal is to maintain the x and y thickness within specified tolerances. Thickness variations arise primarily from variations in thickness and hardness of the incoming beam (input disturbance) and eccentricities of the rolling cylinders. 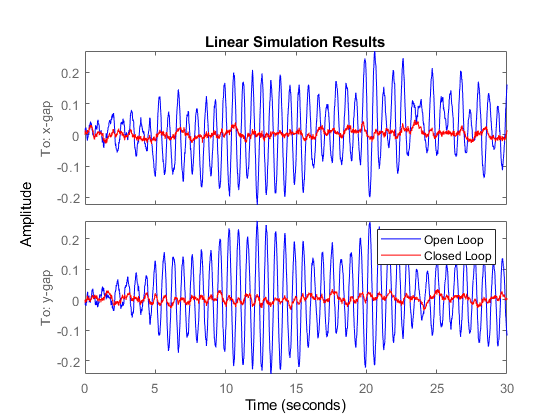 An open-loop model for the x or y axes is shown in Figure 3. 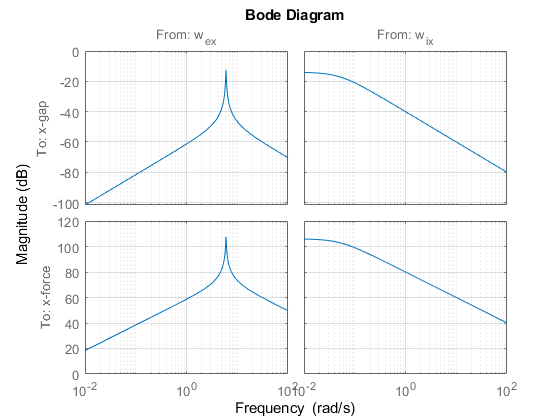 The eccentricity disturbance is modeled as white noise w_e driving a band-pass filter Fe. 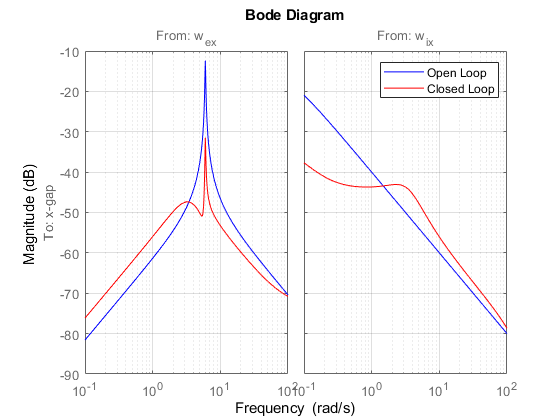 The input thickness disturbance is modeled as white noise w_i driving a low-pass filter Fi. Feedback control is necessary to counter such disturbances. Because the roll gap delta cannot be measured close to the stand, the rolling force f is used for feedback. Note the peak at 6 rad/sec corresponding to the (periodic) eccentricity disturbance. First design an LQG regulator to attenuate the thickness variations due to the eccentricity and input thickness disturbances w_e and w_i. 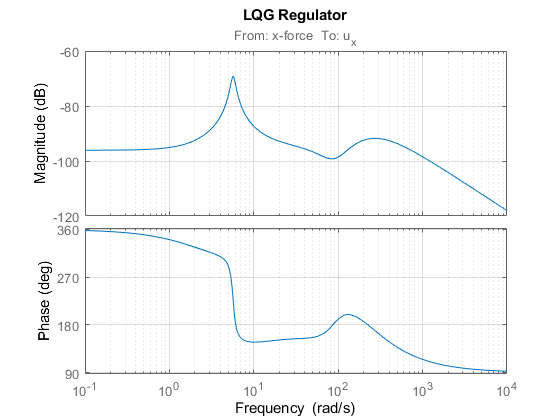 LQG regulators generate actuator commands u = -K x_e where x_e is an estimate of the plant states. This estimate is derived from available measurements of the rolling force f using an observer called "Kalman filter." 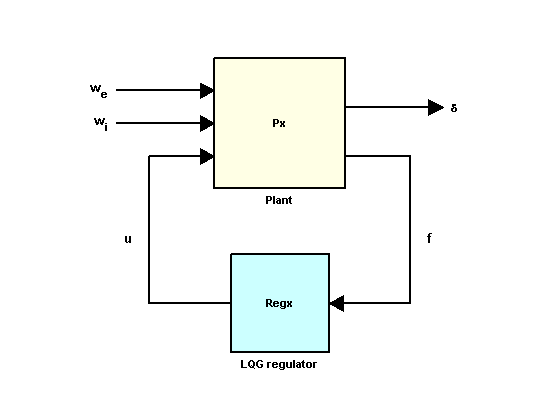 Figure 4: LQG Control Structure. Note that in this command, the +1 accounts for the fact that lqgreg computes a positive feedback compensator. Assuming the x- and y-axis are decoupled, you can use these two regulators independently to control the two-axis rolling mill. Treating each axis separately is valid as long as they are fairly decoupled. Unfortunately, rolling mills have some amount of cross-coupling between axes because an increase in force along x compresses the material and causes a relative decrease in force along the y axis. 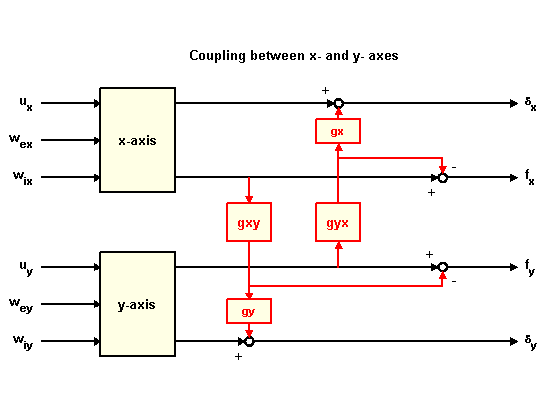 Cross-coupling effects are modeled as shown in Figure 5 with gxy=0.1 and gyx=0.4. Note the high thickness variations along the x axis. Treating each axis separately is inadequate and you need to use a joint-axis, MIMO design to correctly handle cross-coupling effects. 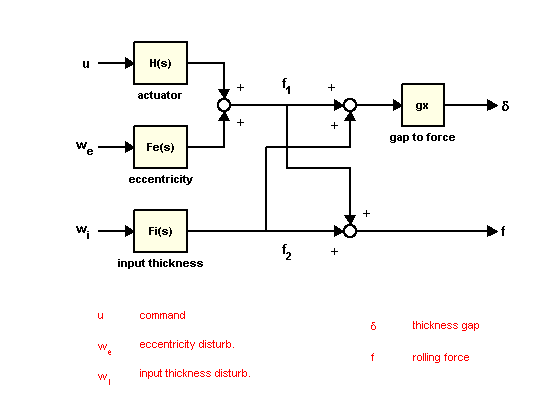 The MIMO design consists of a single regulator that uses both force measurements fx and fy to compute the actuator commands, u_x and u_y. This control architecture is depicted in Figure 6. 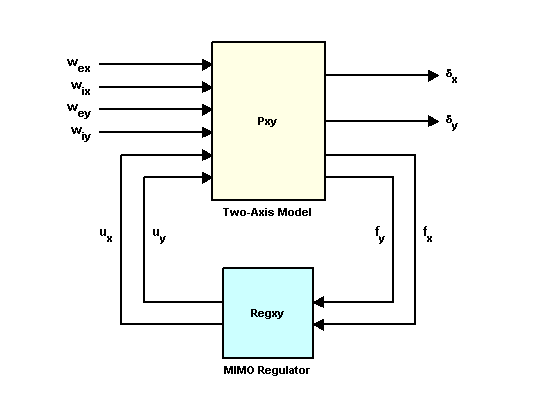 Figure 6: MIMO Control Structure. 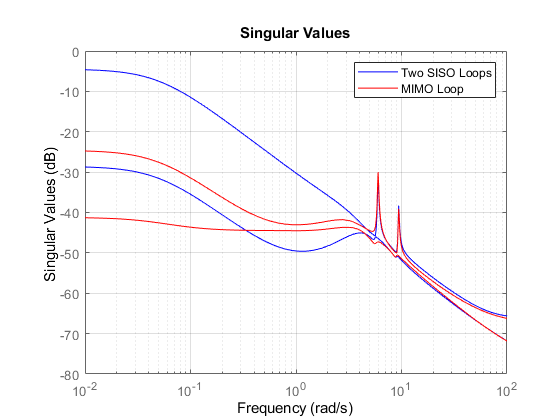 Note how the MIMO regulator does a better job at keeping the gain equally low in all directions. 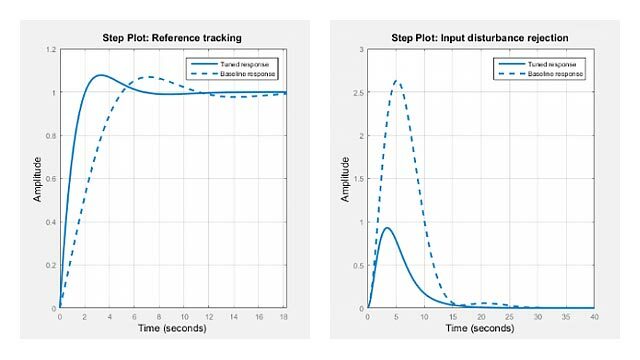 If you are a Simulink® user, click on the link below to open a companion Simulink® model that implements both multi-loop SISO and MIMO control architectures. 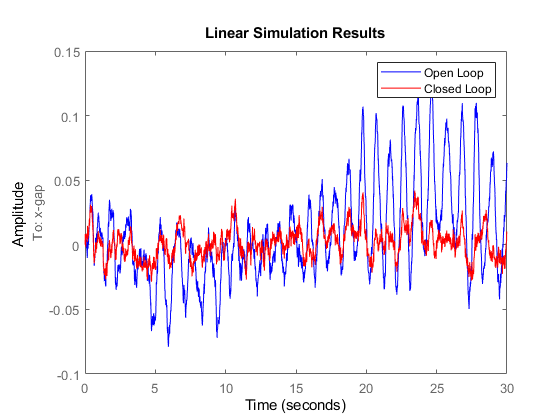 You can use this model to compare both designs by switching between designs during simulation. 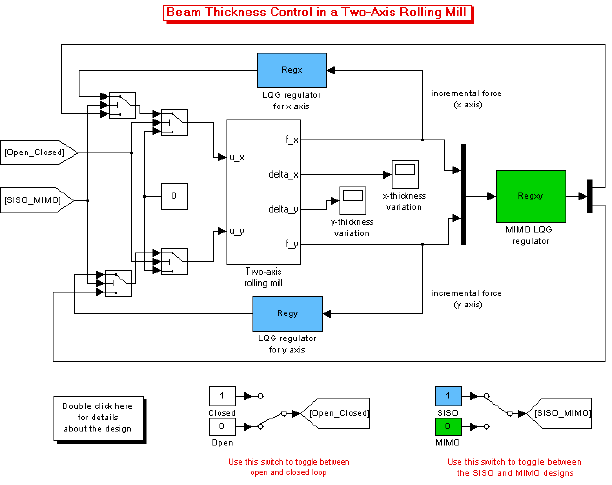 Open Simulink model of two-axis rolling mill.